As you may recall, we lost a hen last spring to what was likely a case of egg yolk peritonitis (EYP). EYP is when the egg does not form properly inside the hen and then the yolk can remain inside the hen and cause an internal infection. EYP is almost always fatal. 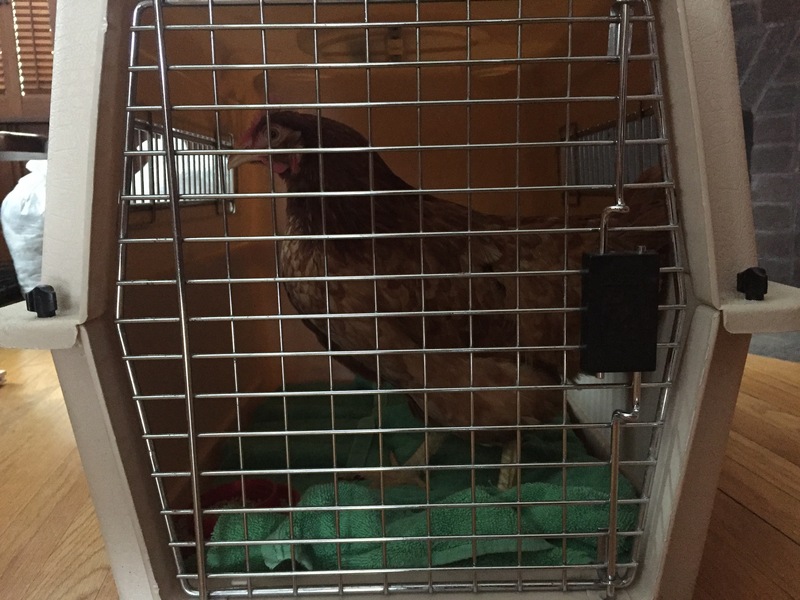 A few weeks ago, another of our hens, Mindy, was exhibiting similar symptoms. She was somewhat more lethargic than normal and she was also walking upright like a penguin. We recognized the symptoms from our prior experience. We separated her from the flock. After last time, we had asked around the area and had been given the names of several local vets who are willing to see chickens. We packed her up in a travel dog crate and took her to the vet at their first open slot. Mindy in a crate ready for transport to the vet. Not surprisingly, in the waiting room, we were the only one with a chicken instead of a dog or cat. After meeting with the vet, the situation was not looking great. Mindy’s abdomen was enlarged and somewhat solid to the touch. The vet could not provide a specific diagnosis and there were a number of possibilities, most of them were very likely to be fatal. Mindy’s only realistic chance was exploratory surgery. The vet could not provide any likelihood for success because there are very few chicken surgeries (the cost of a chicken is so low compared to the cost of surgery that few people ever take chickens to a vet at all, let alone for a surgery). We opted for the surgery.